Last week Gabriel built himself a super amazingly cool awesome Spider-Man motorcycle. He's been rushing home after school to play with it every day because hey! It's so cool! Yup. 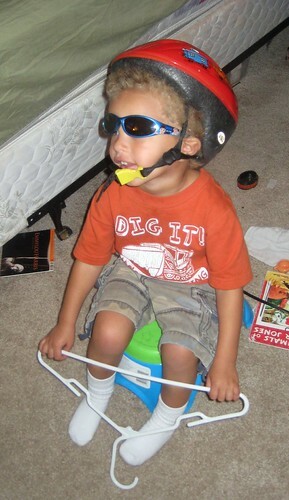 That's a bathroom stool, a hanger, a bike helmet, and some trusty sunglasses. Don't ask me how Spider-Man fits into the picture. I have no answers. Unfortunately his motorcycle lives next to my bed, which is also where I like to keep my garbage. I guess one answer could be finding a new place to keep refuse (are /rɪˈfyuz/ and /ˈrɛfyus/ really spelled the same?? I hate you English! ), but I rather like to have it next to my bed, where it's handy. P.S. If you're looking at that last parenthetical and are thinking 'The hell?? ', those pronunciations are thanks to IPA, which is not India Pale Ale, but is the International Phonetic Alphabet, and also the ONLY THING I LEARNED IN COLLEGE. It looks like we buy our clothes at the same place. What an imagination. 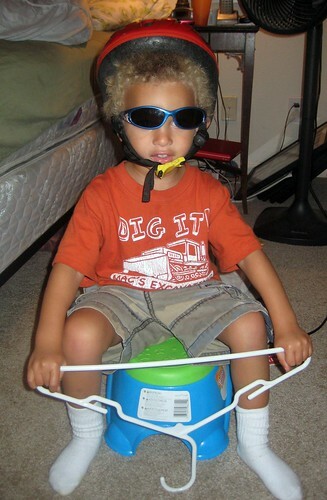 He retains that when he gets older, so he can pretend that his first car is something cooler than what all first cars are. oh my word, he is too cute! i hope that my kids are that imaginative! Things I learned from this post: 1. Gabriel has the best hair ever. 2. He also owns the coolest shoes. 3. I have that exact same stool in Henners' bathroom. 4. Your son has the best imagination ever. This was priceless. This is very funny and also very cute. I should take a photo of what it looks like beside my bed, 'cos honey you ain't got nothing to worry about. Mine is much worse. And I don't have a cute kid to distract people from it. My inability to crop garbage out of pictures is one big reason I don't have many pictures on my blog. I just use thousands of words instead. 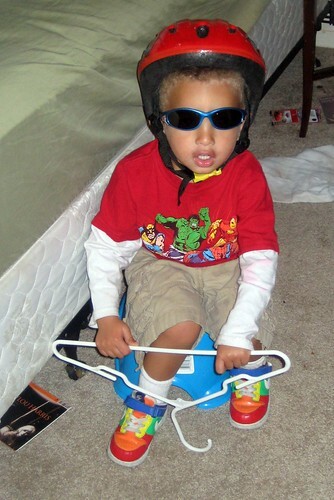 And that motorcycle makes complete sense to me, and is just about exactly what I would come up with if pressed, even today-- the stool is an easy, versatile seat, the hanger is a logical handlebar, and the helmet and sunglasses are just good safety. After all, what is Spider-Man but a beacon of responsibility to the kids of the world? I want to see what he comes up with for the Spider-Man one-person submarine. Gosh I want me some rainbow shoes! I love to see kid's imaginations at work! Your kid is just so darn cute!!! It's Spiderman because of the red helmet and blue sunglasses, Mom! I love how creative kids are! They live in such a great world!